Today’s lesson covers the basic meaning of the term covenant and explains that the Bible contains a series of covenants made with various individuals. The author then goes on to discuss what he terms, “the original covenant with Adam in the Garden of Eden before sin.”. 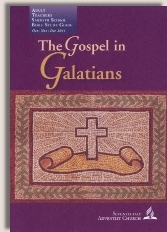 The author opens the lesson by making the statement, “Many regard Paul’s interpretation of the history of Israel in Galatians 4:21–31 as the most difficult passage in his letter.” Arguably, the author would have been more correct to specify something like, “Many [Seventh-day Adventist] regard...”. Many Christians would not consider this to be a particularly difficult passage and have no problem whatsoever grasping its meaning. This passage is only difficult if you come to it with a preconceived belief system that contradicts the plain thrust of Paul’s allegory in Galatians 4. The Adventist belief system teaches that the covenant document given at Sinai is the eternal transcript of God’s character and is therefore binding on all people in all times. Paul’s teaching clearly contradicts Adventist theology so this passage is indeed very difficult for Seventh-day Adventists. This may explain why the author does not offer any direct line-by-line exegesis of what Paul actually says, either in today’s lesson or throughout the rest of the week. The author instead turns Sunday’s lesson to Adam and Eve in the Garden of Eden. It is debatable if Adam and Eve’s pre-fall relationship to God is best described in covenant terminology. That point will not be argued here, but since the Bible does not present the pre-fall relationship in covenant format, at the least, one should not be dogmatic about what this covenant might have encompassed. Never the less, the author states that “marriage, physical labor, and the Sabbath were part of the general provisions of the covenant covenant of creation”. He states this as a fact without providing any direct biblical support. This is a common argument within SDA theology, most often used to bolster the argument that Sabbath observance has always been required of all people in all times. Since this is one of the more ubiquitous arguments for carrying the Old Covenant sign of the Sabbath into the New Covenant, let us examine whether or not this is truly a strong biblical argument. We must first understand when and with whom the Old Covenant, of which Sabbath observance was the sign, was made. This appears to be a deliberate distortion of the word of God in order to support the idea that Sabbath observance by human beings preceded the exodus. The author of the Clear Word evidently found this necessary since there is no direct Biblical evidence for such an assertion. Although we see God resting or ceasing from His work of creating, there is no recorded command or instruction for any human being to do so prior to the exodus. There is no mention of Adam or Eve being instructed in or ever observing Sabbath. When studying Hebrews chapters 3 and 4, one discovers that God is still in His rest and we today are being invited back into that rest through faith in Jesus. This suggests that Adam and Eve would have continued in that rest indefinitely if they had not fallen into sin and required a Messiah to restore that rest. It is interesting that Moses goes to great pains in Genesis 1 to set up a repetitive pattern of evenings and mornings for each day, until he comes to the seventh day (or “yom”, a very flexible Hebrew word that can also mean a long span of time). Suddenly, there is a jarring absence of the familiar evening and morning refrain on the seventh “yom”. When one observes such a glaring break in repetition in Hebrew literature, it is never without purpose and one should ask what the author intended to convey. Moses appears to be indicating that this rest was not for a single twenty-four hour time frame, but was to be ongoing. The blessed and sanctified rest of God was never intended to end and mankind was never intended to fall out of that rest. Adam and Eve were created into that ongoing rest and fell out of it when they sinned. In all the Bible, there is no mention of Adam and Eve being instructed to observe a certain ceremonial day in a certain way. The word “Sabbath” is not even used in connection with Adam and Eve. There is no mention of Cain or Abel observing Sabbath. There is no mention of anyone in the godly line of Seth ever observing Sabbath. There is no mention of Enoch, who walked with God, observing Sabbath. There is no mention of Methuselah observing Sabbath. There is no mention of Noah observing Sabbath. There is no mention of any of Noah’s sons observing Sabbath. There is no mention of Job, who lived at about the time of the patriarchs, ever observing Sabbath. There is no mention of Abraham, who was taken out of an idolatrous background, ever observing Sabbath or being instructed in Sabbath observance. There is no mention of Isaac ever observing Sabbath. There is no mention of Jacob or Esau ever observing Sabbath. There is no mention of Joseph ever observing Sabbath. There is no mention of any of Joseph’s brothers ever observing Sabbath. There is no mention of any of the Israelites observing Sabbath while in Egypt. The most we can possibly say about any human observing Sabbath prior to the exodus, is that it is possible, but uncertain. We just don’t know because scripture doesn’t say. There is no scriptural warrant for insisting that people observed Sabbath prior to when the Bible actually tells us they began to observe Sabbath, on the way to Sinai. Given the lack of biblical evidence for the sign of the Old Covenant being observed prior to the exodus, and the strong biblical evidence for the covenant first being given to those who were at Sinai, not their ancestors, it is easy to see why the author of the Clear Word Bible felt it necessary to alter Deut. 5:3 to preserve his theology. However, it is not easy to see why the author of today’s lesson makes this claim as he offers no support for it. Galatians 4:21-31 deals with the Old and New Covenants in a straight forward, easy to understand fashion if one accepts the passage for what it says. It is only difficult to understand if one approaches the passage with preconceived beliefs that contradict the text. Despite the authors unsupported assertion, there is no strong biblical evidence of Sabbath observance being part of a creation covenant.